Discover the power of Demio with a 14 days free trial access with all features. In this long-form review page you will find more information and insights regarding the Demio platform combined with my experiences. Demio is a solution for marketers, entrepreneurs, business owners to run successful webinar campaigns without technical headache.I wanted to give an in-depth review of this solution so you can compare my findings with other ‘live webinar’ solutions you might consider. Look at this review as an informative piece of content helping you in your decision process for purchasing a webinar platform, built for marketing. In the tutorial video you will discover the ins-and-outs of Demio. Covered are, webinar setup, automatic reminder notifications, customizable registration pages, deep marketing integrations, presentation techniques, chat options, automatic replay pages, Live & 'Like Live' replays...and many more. Setting up a webinar, even if this is your first experience, is as easy as filling out a title, date and time for your event. Once this information is completed, you can with Demio actually launch your webinar. It is that simple! A beautiful registration page, ready for further customisation, is hosted on Demio for you. Or instead you you can choose to embed the form to capture registrations on a landing page on your own website. Automatic reminder notifications take care of sending reminder emails to your attendees the day before, and hour before and even 15 minutes before your webinar starts! Making sure the signed up registrants actually don’t miss out your webinar event. Demio offers native integration with various email automation, crm or business automation systems. 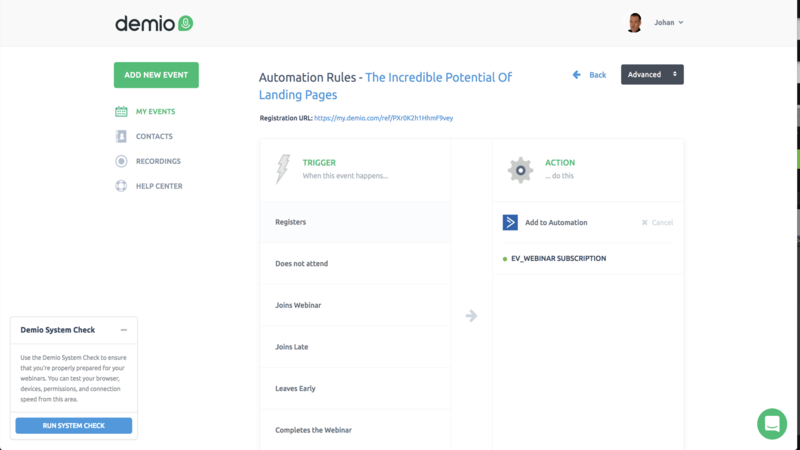 You can start integrating simply by setting up automation rules that tag people upon registration. 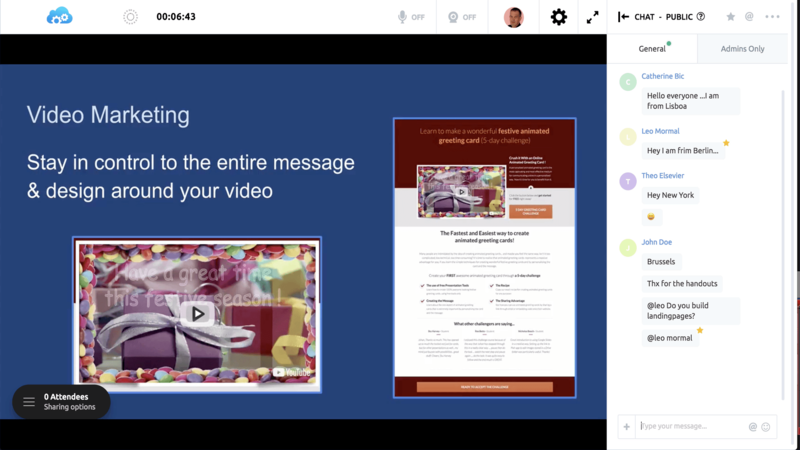 Or, go further and segment people based on their webinar interaction and engagement. Tag and appropriately respond to those who attended, those who did not, those who left early and those who have completely attended the webinar. Automation rules can be created according to your preferences, so that according to audience behaviour specific responses are triggered. Don’t worry if there is no native built-in integration with the tools you use. Demio integrates seamlessly with ‘Zapier’ so it can basically integrate with every web application on the market. With Demio you will never forget to push that record button. Just start your webinar and Demio automatically records your session in HD in the cloud from start to end. The recordings of each webinar session are available for download or as a recording on a beautiful replay page. Set up any of your past webinars to run automatically as an on-demand simulation. The idea is when you want to run a webinar, you choose a past recorded event and create a like live webinar, kind of like live replay. So you can focus on ‘scaling’ your successful recorded campaigns while spending less time presenting. 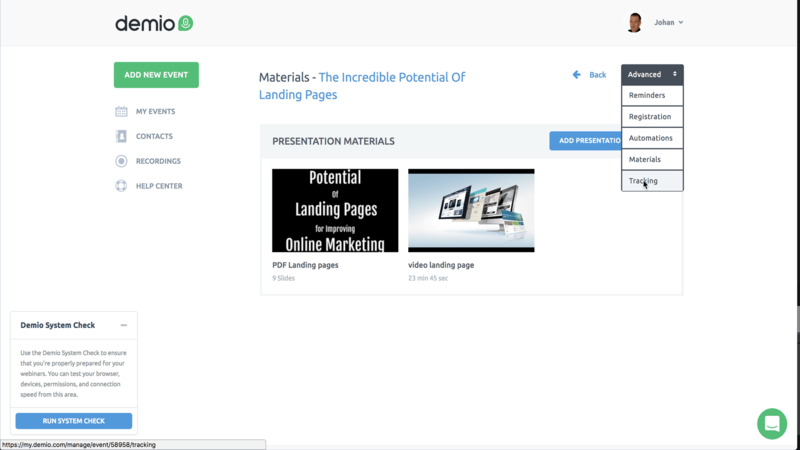 Upload your presentation slides and share videos directly in your webinar room. Instead of ‘screen sharing’ your desktop you can opt not to leave the webinar room when presenting and make advantage of your uploaded presentation materials. Uploading presentation material in Demio also comes in handy when you are planning to do similar webinars over again on a later date? During the new webinar setup, you can copy over presentation material of a past held event. A great way to reduce overhead. When holding your webinar session, Demio makes it easy for you to communicate with your attendees through a real-time chat. You and they can interact through emoji gestures, and have the ability to @ mention other participants. You can read their comments, give feedback, and post questions in real time as you progress through the webinar session. The chat is designed for interaction, a place where you can ask your audience a question at any time. You can organise polls, link audience to a call to action, like an offer, sign up page, or any URL, during the event. Make sure your audience don’t leave empty handed by sharing handouts, gifts, vouchers, coupons, and bonuses to download. A history is kept of the chat comments in the webinar report for later consultation. So even after the webinar ended you can answer missed out questions. 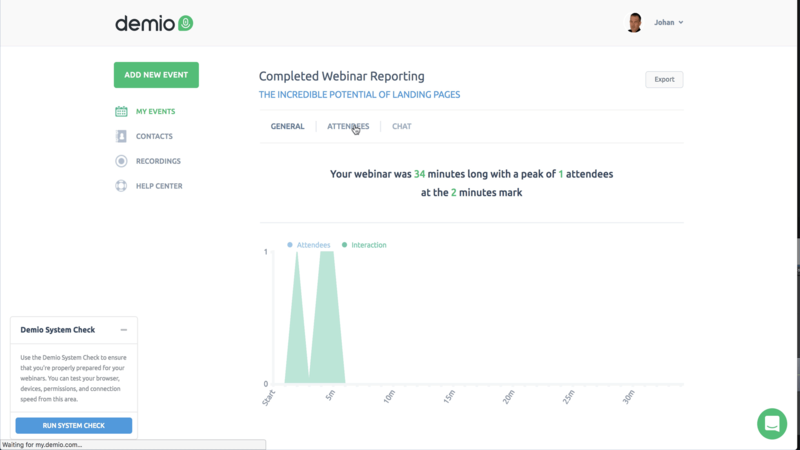 Next to chat history which is kept in reporting, you can measure the effectiveness of your webinar campaigns through in-depth, actionable analytics. Analyze, consult and compare Registrants, Did Not Attend, Attendees, Left Early, Completed Webinar. “The smartest webinar platform with low-latency audio and video streaming"
A webinar platform that is unlike any other platforms. Demio provides features that are completely web-based, with easy registration and third-party integration. Automatic reminder notifications take care of sending reminder emails. This feature alone eliminates a lot of follow up work in your own email automation system. A great interactive real-time chat ensures you can reach out to your audience. Each webinar session is automatically recorded and downloadable. 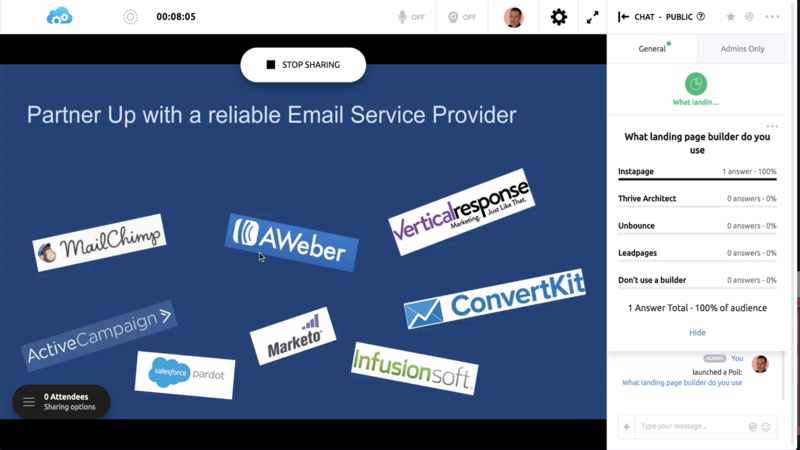 The native built-in integrations facilitate ‘automation rules’ that help you tag and segment your audience based on webinar interaction and engagement. Demio is a trusted, customizable and smart webinar platform that does the simple stuff, but almost easier does the advanced things for any business. 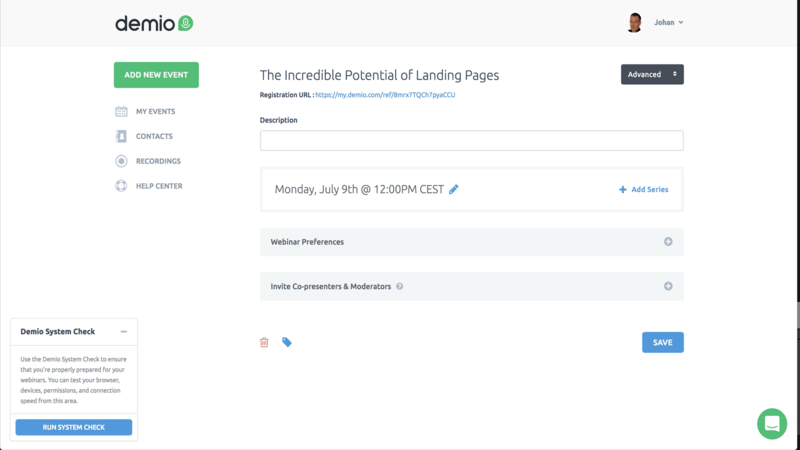 If you are serious about webinars you can’t miss out testing this one. This tutorial review summary gives you at a glance the best way to organise webinars to grow your business.